What are the most precious things we have tucked away in our locked drawers, safes, cupboards, secret compartments? Have we spent time and care, cleaning and placing them lovingly in dry boxes etc. preserving them. Do we expect that they will lasts forever? Do we think we can take them with us when we die? Do we think that whoever takes over will care for them the way we have? “Do not store up for yourselves treasures on earth, where moth and decay destroy, and thieves break in and steal. But store up treasures in heaven, where neither moth nor decay destroys, nor thieves break in and steal. 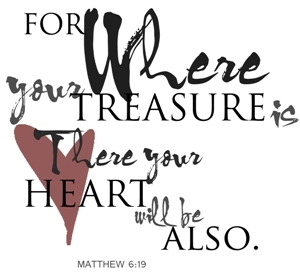 For where your treasure is, there also will your heart be.